With all the phone and tablet launches during Nokia World this year, the new Nokia Portable Wireless Charging Plate almost slipped under the radar (it must be because it’s so thin). However, this totally wireless charger deserves some attention. Designed to be the most flexible and effortless charger, the DC-50 can be popped in your pocket or bag and put into action at a moment’s notice, without the need to plug it in to either your phone, or a wall socket. Measuring 134 x 69mm and weighing only 150g, it’s ideal for giving your phone an extra boost when you’re out and about. Simply place the beautifully designed DC-50 onto a surface and position your Qi-enabled Nokia Lumia on top. Within seconds your Lumia will spring to life and begin charging as if by magic. The DC-50 is unmistakably Nokia, thanks to the high-grade polycarbonate and the same bold and vibrant cyan, red, white an yellow colours that we’re now all familiar with. These colours will match your Lumia perfectly. While this new wireless charger is, well, wireless, it means that you’ll need to keep the DC-50 charged up and you can do that in one of two ways. With a Micro-USB port you can plug it in just as you would a conventional phone. Alternatively, this new charging plate also has the ability to charge wirelessly. Just lay the plate on another wireless charger to fill it up. To check how much battery life is left on the DC-50 there’s a handy power indicator button that will light up an LED indicator when pressed. 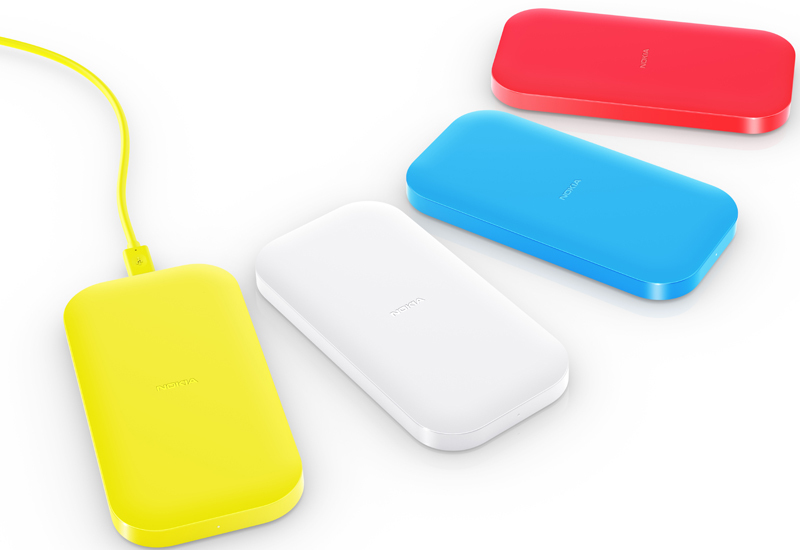 The DC-50 will charge any Qi-enabled smartphone, such as the Nokia Lumia 920 and Lumia 1520 and is available now in Europe, followed by other markets in early 2014, with an estimated price of around EUR 89. What do you think of the new Nokia Portable Wireless Charging Plate? Let us know, below.